Hash is an American dish consisting of a mixture of beef (often corned beef or roast beef), onions, potatoes, and spices that are mashed together into a coarse, chunky paste, and then cooked, either alone, or with other ingredients. 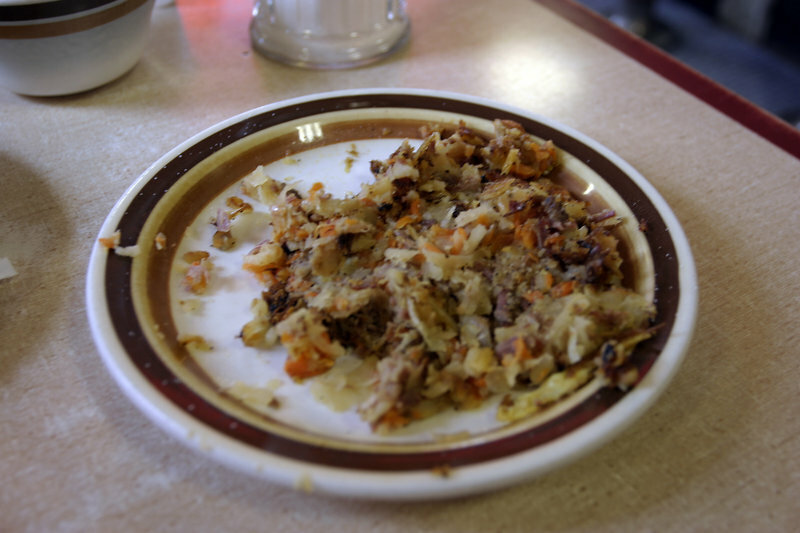 Left: A typical order of corned beef hash, hashed with potatoes and carrots. In many locations, corned beef hash is served primarily as a breakfast food on restaurant menus and as home cuisine, often served with eggs and toast (or biscuits), and occasionally fried potatoes (hashbrowns, home fries, etc). The dish is usually known as corned beef hash with eggs, or corned beef hash and eggs. Alternative versions of the dish use roast beef hash. Alternatively, in the southern United States, the term "hash" refers to a blend of leftover pork from a barbecue mixed with barbecue sauce and served over rice. It is a common side dish at barbecue restaurants in South Carolina and Georgia.